Low hot water pressure can be an inconvenience. Hot water typically flows at the same rate as cold water. However, this isn’t always the case. Knowing how to determine the cause of low hot water pressure can help you prevent significant plumbing issues that can lead to costly repairs. The following are some simple ways to solve low hot water pressure. 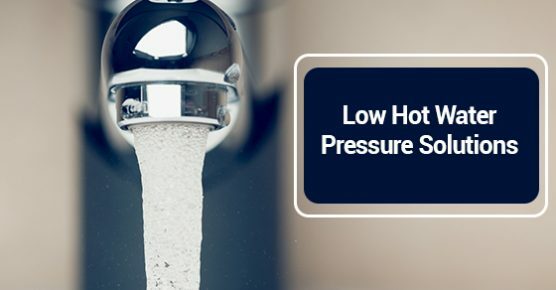 What causes low hot water pressure? If you’re having recurring problems with the flow of hot water in your home, it could be a problem with calcium buildup in your home’s pipes. This often occurs in areas with hard water that contains lime and other minerals. A broken pipe could also cause issues with hot water pressure. If a pipe that’s used solely for hot water has developed a leak, it can decrease the pressure of water coming out of the tap. Additionally, the valve that controls the flow of water leading to your hot water heater could be partially closed, which restricts the flow of water. There are a number of steps you can take to address the cause of low hot water pressure. If the problem only affects a couple of fixtures, then the cause is probably a leak or build-up somewhere in your home’s piping. When low hot water pressure affects the entire home, your hot water heater may be the source of the issue. If you have a basement or crawl space, take a look around to see if you detect any leaky pipes. Check your walls and floors for signs of water damage. If you locate leaky pipes, be sure to get them repaired as soon as possible by a professional plumber to improve hot water pressure and prevent further damage in your home. Getting inside your pipes to look for calcium build-up isn’t easy. So the best way to check is to examine your fixtures. If the shower head or faucet is clogged with mineral deposits, then your pipes may be also be clogged. This can be difficult to address and may require you to consult with a professional plumber. If low hot water pressure is occurring throughout your home, you may be having a problem with your water heater. Check your hot water heater to make sure its valves are in proper working condition and that there are no damages or obstructions. DIY plumbing repairs can lead to costly mistakes. If you’re having persistent low hot water pressure and can’t determine the cause, you’ll need to contact a local professional plumber. Low hot water pressure is a common issue in today’s households. There are a number of factors that contribute to this problem. Knowing how to identify them can help you determine the best solutions for your needs and prevent costly repairs down the line.